With little more than four months left in her term and questions swirling over whether the White House will ask her to stay on for another four years, Janet Yellen has turned that story around. A little more than four months left in Janet Yellen's term as Federal Reserve chair. 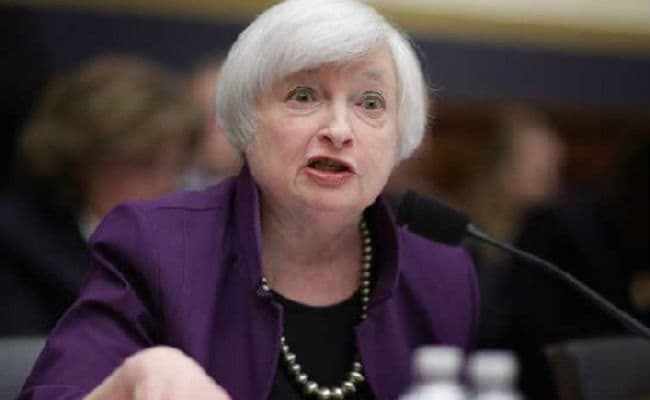 New York/Washington: From her early days as Federal Reserve chair, Janet Yellen has been the target of criticism from Republicans worried that the central bank's massive bond-buying programs and near-zero interest rates engineered by her predecessor would be the ruin of the country. With little more than four months left in her term and questions swirling over whether the White House will ask her to stay on for another four years, Yellen has turned that story around. The Fed has raised rates faster than markets had thought possible this year and, on Wednesday, it announced its $4.5 trillion bond portfolio would begin to shrink in October. All the while, unemployment has plunged to boomtime levels and inflation has remained well in check. Now Yellen's stock appears to be rising, both among her critics and on a real-money exchange where traders can place bets on who they think will be the next Fed chair. "I'm glad we are finally at this point - I have been encouraging both privately and publicly the Fed to do this. We'll see whether it truly is an end to the era," said U.S. Representative Bill Huizenga, a Republican who has pushed a bill to tie the central bank's decisions to a monetary policy rule. That Is an idea that Yellen has opposed, saying it would restrict policy options. Still Huizenga, who sits on the House Financial Services Committee and its subcommittee on monetary policy and trade, does not appear to endorse her. "I like her," he told Reuters. "I would like to just make sure that the White House and president are making a thorough examination (of her record) - not just on a whim of, hey, interest rates are low ..."
President Donald Trump has given few hints as to whether he will reappoint or replace Yellen before her term ends in early February. There are few signs the appointment process has moved forward at all or that it is a priority for the administration. And on Predictit.org, a financial prediction market for political and financial events where the Fed Chair contracts trade, the stock of former Fed Governor and Wall Street banker Kevin Warsh has also risen. Traders are currently paying 30 cents for contracts that would pay out $1 if Yellen gets the nod; Warsh contracts are going for 30 cents. Warsh was a Fed governor between 2006 and 2011 and criticized the Fed's bond buying program, saying it would drive inflation sharply higher. That view has been a common thread among mostly conservative economists in their criticism of the Fed under both Ben Bernanke and Yellen. Other possible options include Gary Cohn, a former Goldman Sachs president who is Trump's top economic adviser and who is leading the search for a new chair, and John Taylor, a Stanford University economist and a favorite of congressional Republicans. "In general, I believe we need more of a hawk than a dove in that position," said Huizenga, adding he has not formally suggested names nor been asked by the White House. "I would be comfortable with John Taylor." Cohn's stock is at 15 cents on Predictit.org, down from the 48 cents it fetched midsummer; Taylor trails along with Columbia Business School Dean Glenn Hubbard at 2 cents. Yellen's appeal is seen as limited by her support for crisis-era financial regulations that Republicans want to roll back. With Vice Chair Stanley Fischer set to retire in mid-October, the Trump administration needs "to come up with two names, not one. ... Perhaps a ticket like Warsh as chair and Hubbard as vice chair has a good chance," said Michael Gapen, chief U.S. economist for Barclays, who believes Yellen is unlikely to retain her job. Still, Gapen said, "if you are looking for someone to continue to normalize policy, she would be someone you might want to consider."